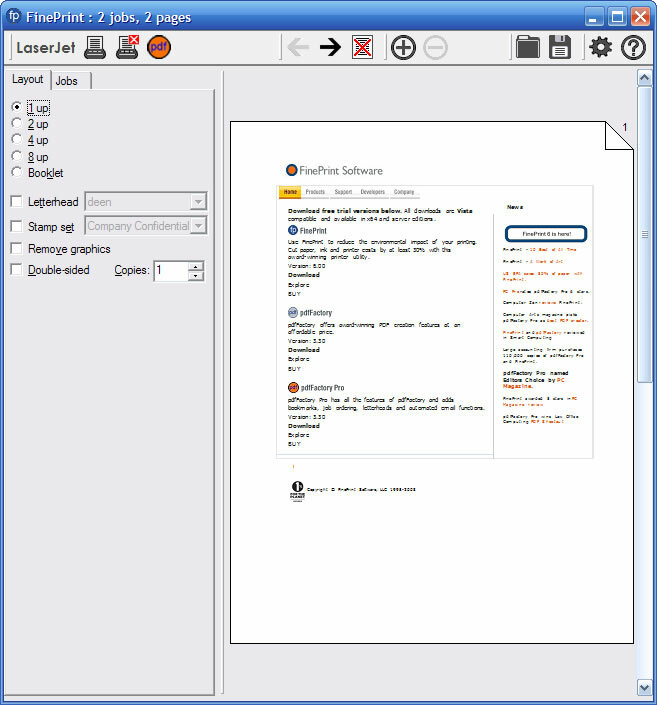 FinePrint is a Windows printer driver that provides advanced printing capability. You can create booklets, print double sided on any printer, print on your own electronic letterhead, and create new documents by combining your print jobs together. You can add gutters for binding all with complete assurance that the printed output will match the preview on screen. Excellent piece of software... still 5 stars, but priprinter is currently the king of virtualprinter/previewers. Years ago I used an older version and it seemed to have more features than the newer version so it seems like you're getting less for your money nowadays. But I do like the print quality of FP more than other programs that do the same ... seems easier to read and that is important. 6.05 x64 version is broken (as mentioned below). 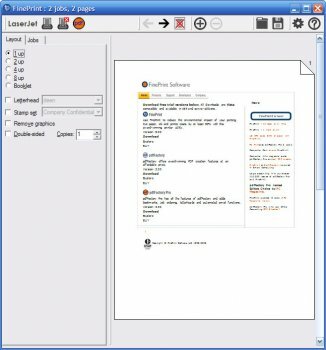 It crashes when printing from 32 bit applications. Stick with 6.04 for now. I took another look at Pri and couldnt find multiple letterhead support and the quality of the logo (in bmp form) was lower than that I could achieve on fineprint. I believe that for many people, the two pieces of software are really aimed at different target markets but have a few overlaps which may catch a few people in the middle. Doubledoom - PriPrinter supports both letterheads (print from any app to PriPrinter and then select Save As Form...) and per tray settings. 6.05 (and pdffactory pro 3.40) did not work for me. They both failed when printing a web page from Firefox 3.0.5 (and Windows XP SP3). I went back to the previous version. New interface with version 6* was really an unnecessary change but you quickly get used to it. Took a look at the priprinter mentioned below but it doesnt offer a number of the fineprint features that i would need (letterheads, printing trays to name just two). So, on that basis I quick fineprint a 5 because it does everything I want and does it well. Good tool, but for that kind of money priPrinter delivers real innovation. Yea, I gotta go with others here priPrinter is far more flexible and useful compared with FinePrint. I've always given it a 5-rating, but priPrinter is that much better. Defenestration: Wow! Thanks so much! priPrinter is AMAZING!!!!!!!!!!!!!!!!! I mean, FP is fine and all, but OMG look at priPrinter!!! Good software, but nothing really new for version 6. Used to be the best, but has now been overtaken by the superior priPrinter. A must-have for anyone who prints on pc. Especially a must-have for anyone caring about the enviroment! Fineprint 6.0 is the best at what it does! Its way better then my Canon Printer print preview!